Welcome to the future of hair… well almost. 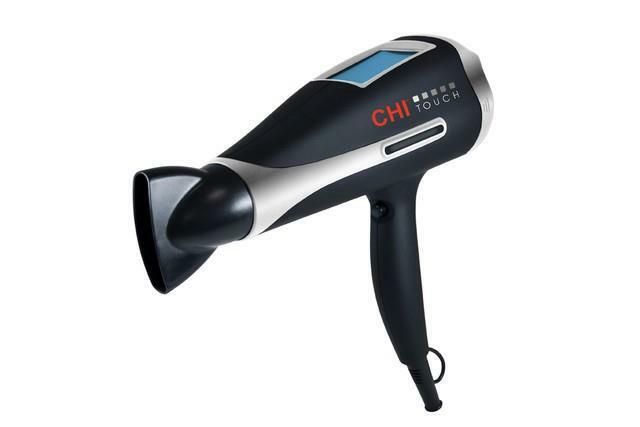 CHI recently released a new hair dryer that requires no buttons to function. Instead, it has a touch screen that allows you to regulate the power, heat, and ions based on your hair type – Fine, Medium, Course. It cuts down on drying time, is lightweight, and is supposedly extremely quiet. It’s customizable ION settings help eliminate frizz, reduce static and rehydrates hair, according to CHI. I think it sounds like a great product and is definitely worth a try. The only thing I see that could go wrong is for someone that likes to frequently change settings in between their blow-dry. I would imagine it would be quite annoying to set it down and keep changing the options – but worth a try. I would personally use it with a ceramic round hair brush. The ceramic part of the brush heats up from the heat of the hair dryer and gets your hair straight and dry quicker. It also helps you play around with rounded ends, and curls without using a curling iron. I use Prego Spornette – clicking on the picture of the hairbrush takes you to the link from where I bought mine.